Bolashak would be delighted to welcome you to this fascinating and diverse country. 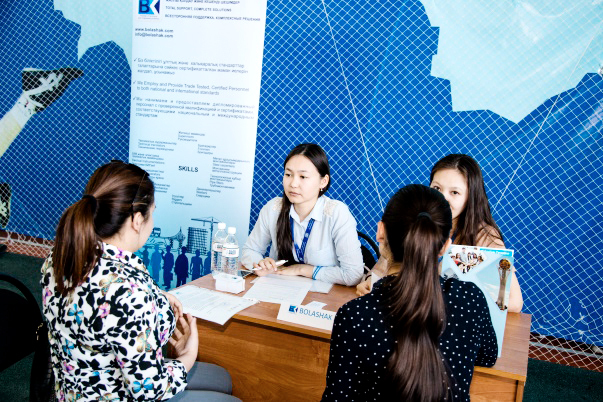 We are pleased to provide you with some general information about the locations in which we operate both in Kazakhstan, as well as the UK and other international locations. Atyrau is the urban centre of Kazakhstan’s oil industry. It started as a fishing settlement in the 17th century, originally known as Nizhny Yaitsk. It was renamed Guryev in the early 18th century, after the family of Russian traders who settled in the town and fortified and strengthened it. It continued to be known as Guryev until 1992 when it was renamed Atyrau after independence. Crude oil was first found in the Atyrau region in the 1890s, and oil replaced fish as the primary industry. There are a number of oil fields in production in the region, including the two giant fields, Tengiz and Kashagan. 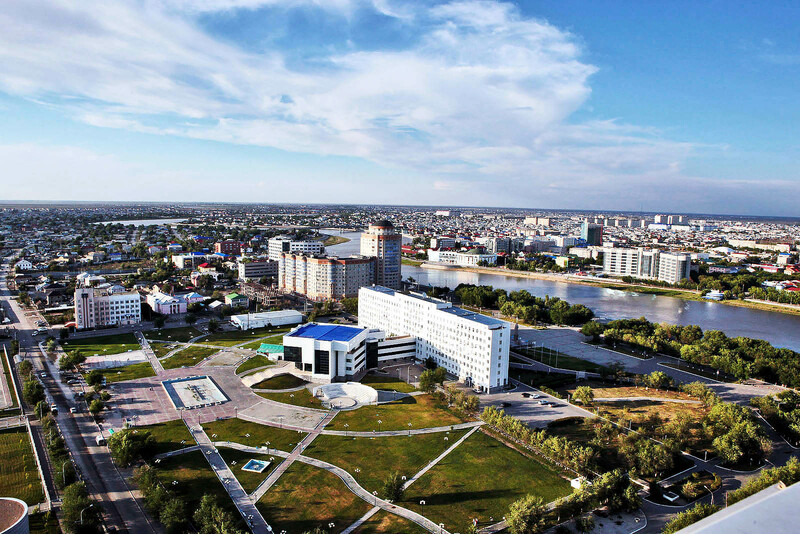 With the growth of the oil industry, Atyrau has seen much development over the last twenty years. New apartment blocks, business centres, housing developments, hotels, restaurants and shopping centres have appeared across the city. 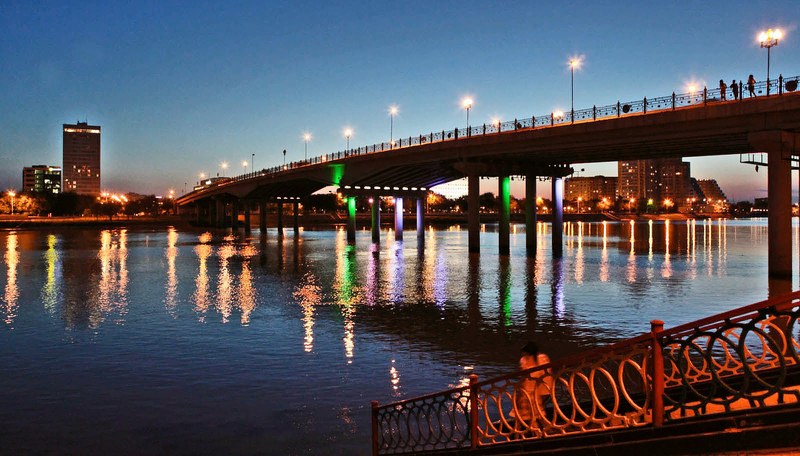 The Ural river, known in Kazakh as the Zhaik, runs through the city centre. It is the natural border between Europe and Asia. There are pleasant walking paths running along the banks of the river. The river is usually frozen over during the winter months, with keen fishermen sitting around holes in the ice. There is a bridge which crosses the river in the city centre, which has come to symbolize the place where the two continents of Europe and Asia meet. 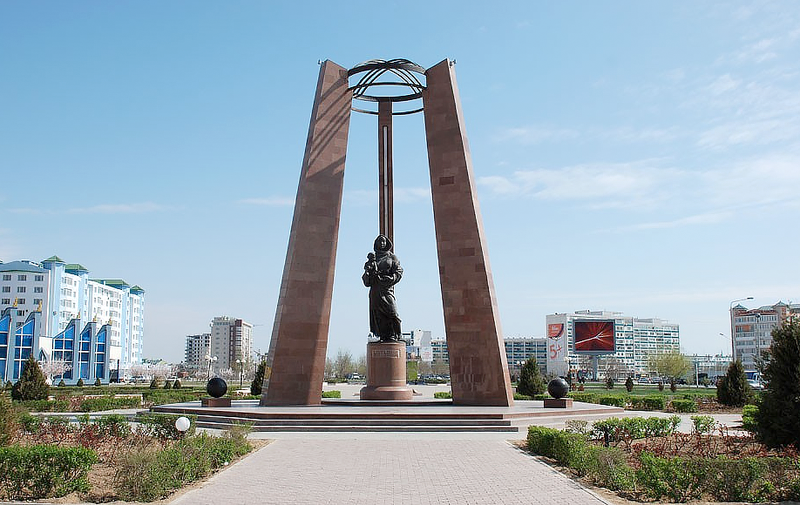 Places of note in Atyrau include the regional administration building, the imposing white building on the bank of the European side of the Ural, in front of which stands the statue of Baybars, a 13th century ruler of Egypt, who is believed to have been born here. Further up the main Satpayev Street is a wide square with an imposing statue of Makhambet, the poet, and his friend Isatay, who . The square is a popular place for people to gather and relax at weekends. It is close to the new mosque, and the historic Uspensky cathedral, dating from the 1880s, is nearby. Also, on the European side is Victory Park, which is connected by footbridge across the Ural to the pleasant, leafy suburb of Zhilgorodok. 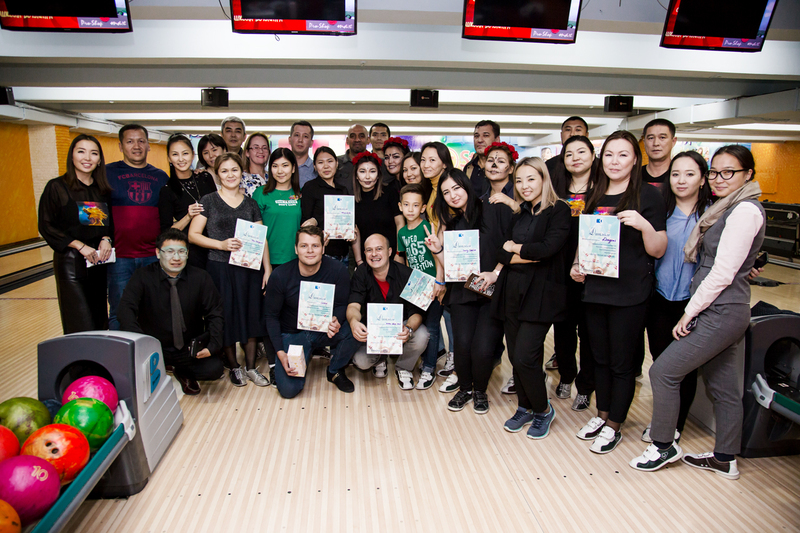 There are many places to eat and drink in Atyrau – Irish bars, restaurants serving sushi, pizza and a range of international options, and traditional Kazakh and Central Asian restaurants. Kazakhstan is a big country. Its territory occupies 2.7 million square kilometers and it is the world’s ninth largest country. Kazakhstan's geographical area is larger than the twelve countries of the European Union combined. Kazakhstan borders with China, Kyrgyzstan, Turkmenistan, Uzbekistan and Russia. 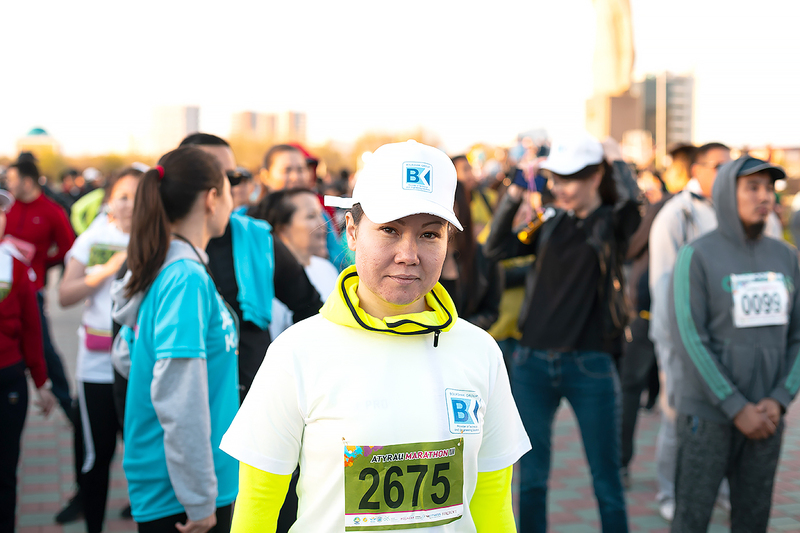 Kazakhstan stretches for more than 3,000 km (covering two time zones) from the lower reaches of the Volga in the west to the foothills of the Altai Mountains in the east, and almost 2,000 km from the West Siberian Lowland in the north to the Kyzyl Kum desert in the south. 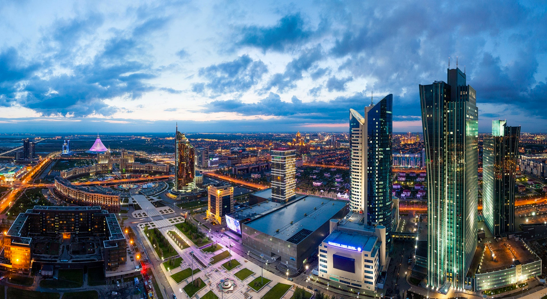 Capital: Astana (since December 10th 1997) with a population of 828,759 (2014). Language: Kazakh is the state language, but Russian is also widely used. Currency: Kazakh currency is tenge (KZT). 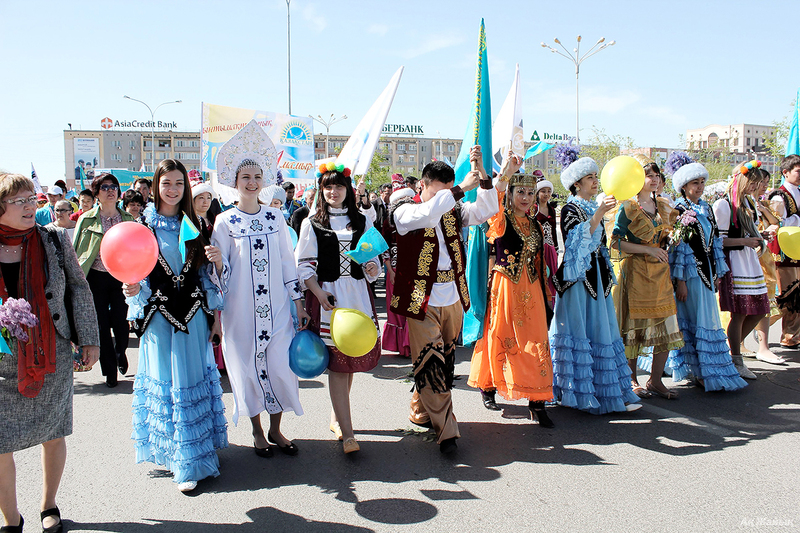 Religion: The Republic of Kazakhstan is a diverse country, inhabited by more than 120 ethnic groups. The main religion is Islam, but the country is also home to people of many other religions, including Christianity and Judaism. Geography: Kazakhstan is also very diverse geographically. A major part of Kazakhstan contains desert and steppe, but in other areas, there are forests, lakes and mountains. 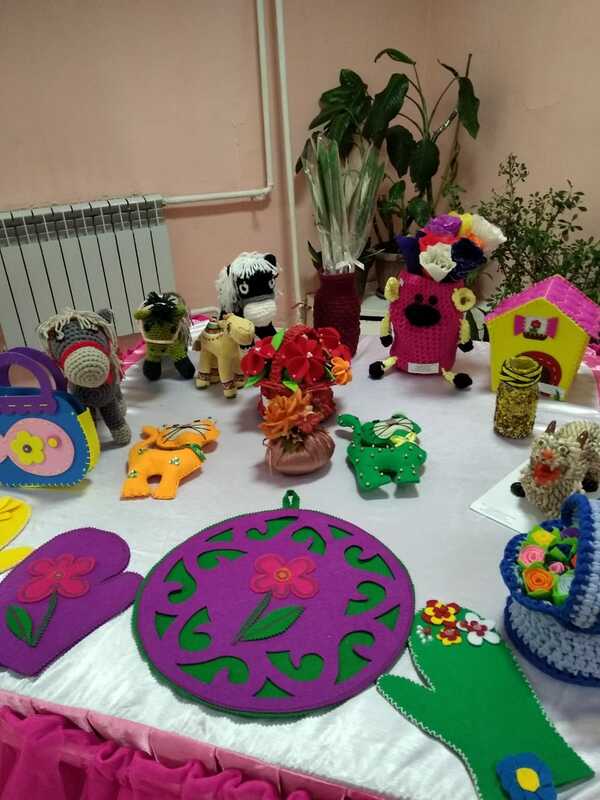 The story of Kazakhstan is rich and fascinating – its history spans from times when it was populated by nomadic peoples, with the Northern Route of the Silk Roads running through the southern part of the country, through to the 20th Century when the country formed part of the Soviet Union and to the present day as a successful independent country. After the collapse of the Soviet Union, Kazakhstan became independent in 1991. The period since independence has seen the country develop and prosper. It is the largest economy in Central Asia and is a major supplier of oil and of a huge range of minerals. Kazakhstan is a fascinating country of diverse landscapes, friendly and hospitable people and a growing economy. We look forward to welcoming you to Kazakhstan and supporting you through a long and successful assignment here. 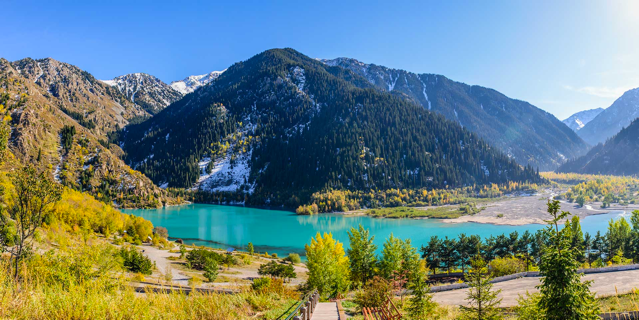 Almaty is the largest city in Kazakhstan, located on the south-east of Kazakhstan, in the foothills of the Trans-Ili Alatau mountain range. The city’s population is about 1,9 million inhabitants. Although Almaty is no longer the capital of the Republic, the city remains the financial, economic and cultural centre of Central Asia. The city has many business centres, theatres, museums, art galleries, exhibition halls and modern entertainment complexes (cinemas, night clubs, parks, restaurants, cafes). 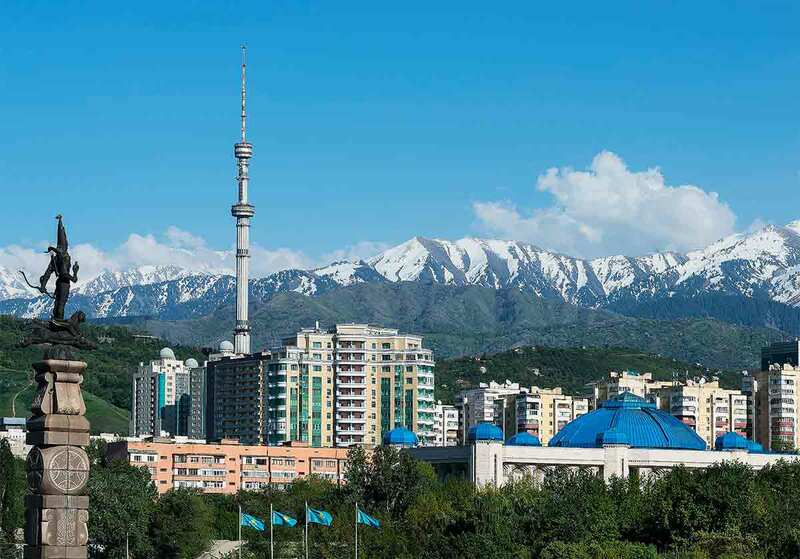 Almaty is often considered a garden city, surrounded by magnificent Tien Shan firs, and the city itself has bustling markets, fountains and squares. 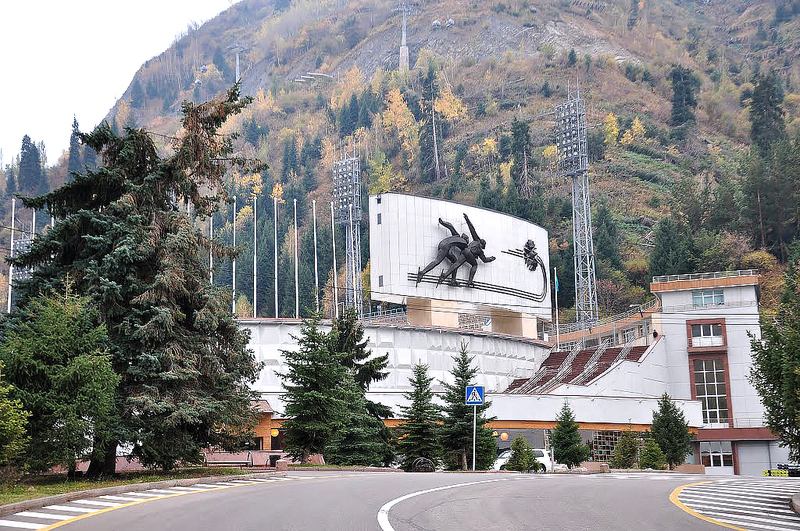 Places to see in Almaty include Panfilov Park in the heart of the city, which is famous for the Alley of Memory, the Eternal Flame, and the monument in honour of the heroes led by Panfilov who died in the battle for Moscow during the Second World War. The park is also home to the Zenkov cathedral, which is built entirely of wood without a single nail, and the Museum of national musical instruments. Other museums to visit include the Central State Museum, which is a reflection of the long history of Kazakhstan, and whose main treasure is an exact miniature copy of the military costume of the “Golden man”, made from 4000 gold pieces, and the Museum of Fine Arts named after A. Kasteev, which holds many national treasures including the history of jewellery art of Kazakhstan. The largest square in the city is Republic Square – where parades and festivals are sometimes held and on which the Monument of Independence stands, dedicated to the history of the Republic. 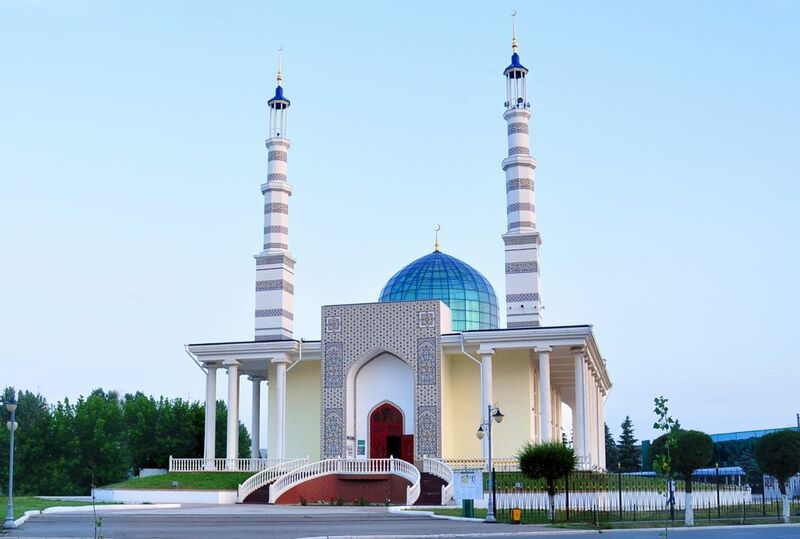 A new Central Mosque was opened in July 1999 in Almaty, which is a grand building of marble with colored tiles made in the Kazakh national style. For lovers of culture, the Abay State Opera and Ballet Theatre holds around three performances every week including well known classics, such as Carmen, La Boheme, Swan Lake and Aida. Picturesque mountains are the hallmark of Almaty. You can enjoy a view from Kok-Tobe (”Blue Mountain”) the highest point of the town, which is accessible by road or cable car. Further up the mountain, out of town, is the skating rink “Medeu” located at an altitude of 1700 above sea level, and is considered to be the world’s largest high-mountain skating rink. From there, you can continue by cable car to the Chimbulak ski resort, which is at an altitude of 2,230 meters. There is a 1,500 meter cableway, which takes you to an altitude of 3163 meters to the Talgar peak. Further out of town is the Great Gorge Almatinka and beyond that, the Big Almaty Lake which is located at an altitude of 2,510 meters above sea level., providing beautiful, fresh mountain air, and the constantly changing lake colour and numerous mountain peaks lure tourists every weekend. A great day trip (a 3-hour drive away), is the Charyn Canyon, one of the unique natural wonders of Kazakhstan. The canyon is about 12 million years old and it is a great experience to walk through the canyon with its vertical cliffs, calling to mind ancient castles created by wind, sun and rain. Astana has been the capital of Kazakhstan since 1997 and is located in the northern central part of the country. Remains of a settlement have been identified dating back to the 8th or 9th centuries. In 1830 a fortress was built here by the Tsarist authorities and the settlement was named Akmola. It became a town in 1862 and gradually developed as a trading centre between Russia and central Asia. 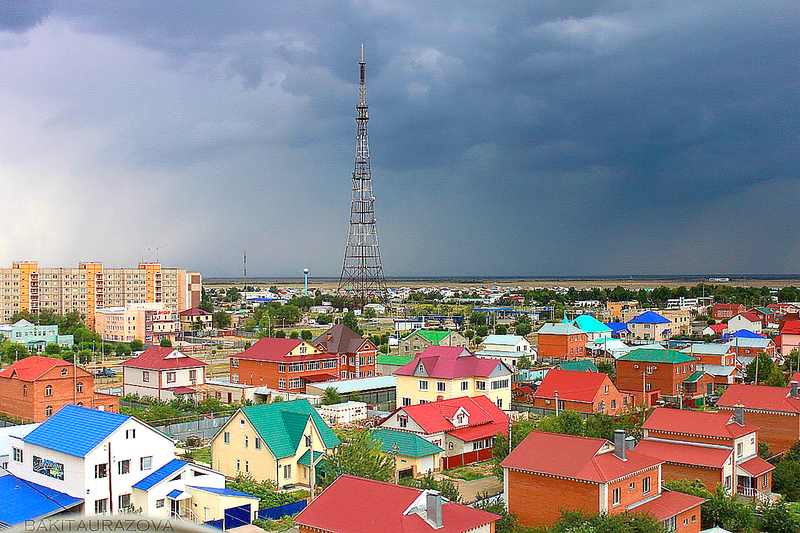 In 1961, the town was renamed Tselinograd and started to house a growing population. 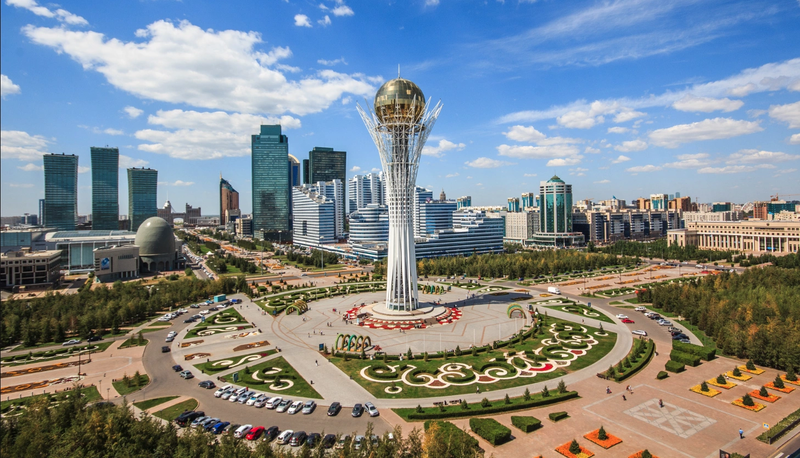 Following independence its name reverted to Akmola, and after the move of Kazakhstan’s capital from Almaty, it was renamed Astana, which means “capital”, in 1997. The country's new capital has risen fast from the northern steppe and is already a showpiece for 21st-century Kazakhstan. Its skyline grows more fantastical by the year as landmark buildings, many of them by leading international architects, sprout along the wide boulevards in a variety of styles. Among these are a number of buildings designed by British architect Sir Norman Foster. One such building is the transparent, tent-shaped Khan Shatyr. Impressive from the outside, the interior boasts shops, entertainment venues, boating river and even a beach resort. There’s the Bayterek Tower too, an exhibition space and observation tower shaped like a tree, topped with a gold mirrored sphere. It is 97m high to represent 1997, the year that Astana became the country’s capital. Another of Foster’s creations is the pyramid-shaped Palace of Peace and Reconciliation, home to an opera house, a museum and conference facilities.2017 was a big year for the city, as it was the host of Expo. The theme of Expo was “Future Energy”. A huge exhibition area was constructed for Expo with many pavilions for the 101 countries and multinational corporations who participated. 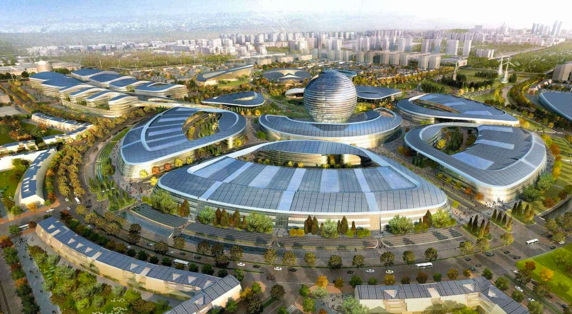 Expo 2017 was a great success for Astana and Kazakhstan as a whole. 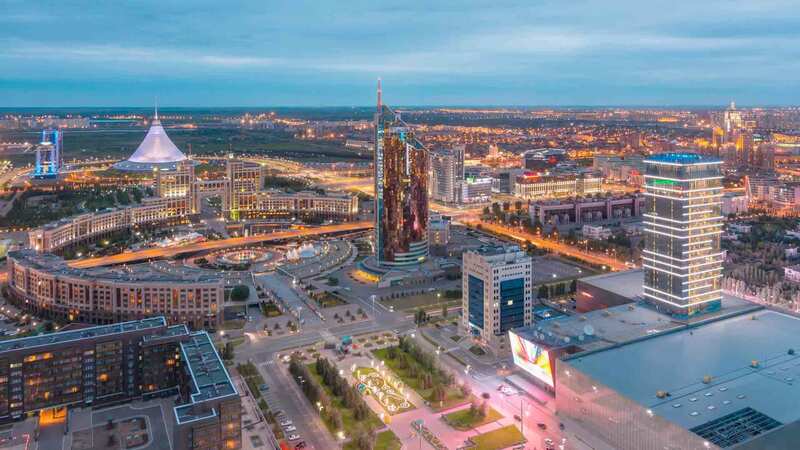 Though characterised by its bitter, windy winters and hot, dusty summers, Astana is a pleasant city with a young, forward-looking feel. It has many hotels, restaurants, shopping centres, sports and cultural centres. 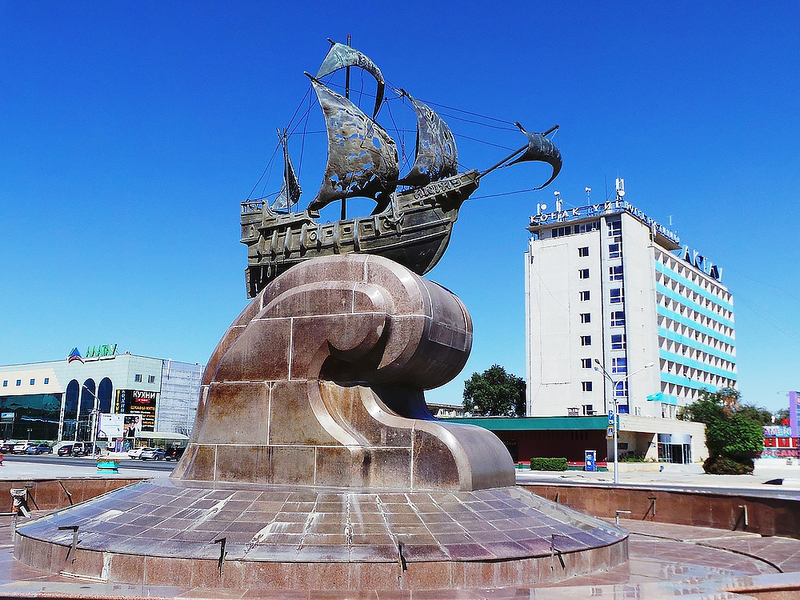 Aktau is situated on the Eastern shore of the Caspian Sea and its port is the largest in Kazakhstan. In the 19th century a journey to the eastern shores of the Caspian Sea was considered not only difficult but a hazardous undertaking. The deserts east of the Caspian Sea were regarded nearly as inaccessible as the Sahara. This was not only because of the harsh climate (+40C in summer and -40C in winter) or the absence of vegetation (no trees or shrubs grow here) nor even because of the scorching winds that raise dust storms. The trouble was that there was no drinkable water in the region, and there seemed to be nowhere one could get it. 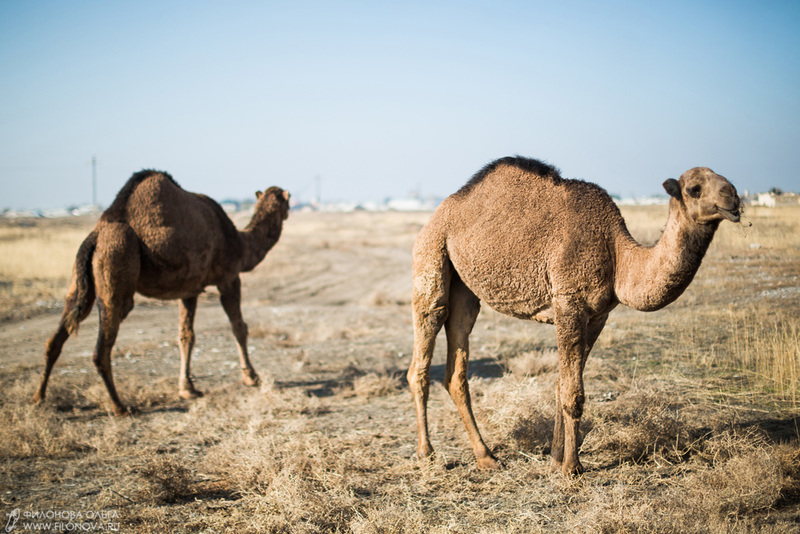 It was exactly for this reason that a town emerged on the Mangyshlak peninsula, in one of the most lifeless deserts in Kazakhstan. Mangyshlak used to be called the “land that has lost water”, but now it is called a “land that has found water”. Aktau is the only city in the world that lives entirely on sea water that has been desalinated and power was obtained using a nuclear reactor. The water-desalinating plant evaporates tens of thousands of cubic meters of salty Caspian water daily, turning it into a distillate which is used for producing potable and industrial water. The city was named Shevchenko in 1964, after the Ukrainian Poet, Taras Shevchenko, who lived nearby, but was renamed Aktau in 1992. Economic growth of the region has developed since rich deposits of uranium and oil and gas were found there in the 1950s. The modern city is now a fast-developing place, its growth fueled by the oil industry. The city is also growing with development plans as an export corridor on the West of Kazakhstan. 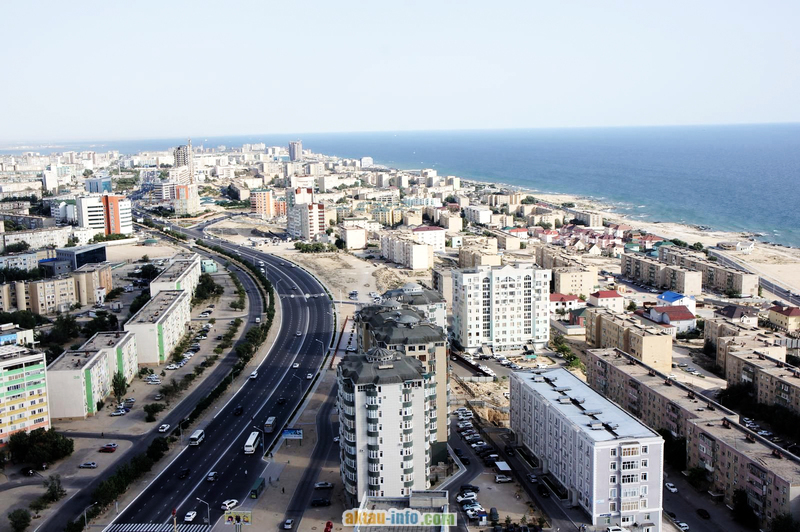 Aktau city is open to the cool summer breezes blowing from the sea while at the same time being protected from desert heat coming from the east. Consequently, a rather mild marine climate has formed here. The city has a beach along its waterfront and there are pleasant walks to be had along the coast road overlooking the Caspian Sea. There are cafes and restaurants throughout the city centre. Outside of town, in the Mangistau peninsula, archaeological findings have been made. Galleries of petroglyphs from the age of the nomads (10th-2nd centuries B.C.) have been found on great mounds in the heart of the peninsula, as well as a necropolis with gravestones decorated with complex ornamentation. Two ancient underground mosques, built a thousand years ago, were discovered near Ungazy mountain. The most interesting of these two is Shakpak Ata mosque, because, although Islam banned the portrayal of people or their body parts, on the walls of this mosque, surrounded by lotus blossoms, is a painting of a man’s palm. 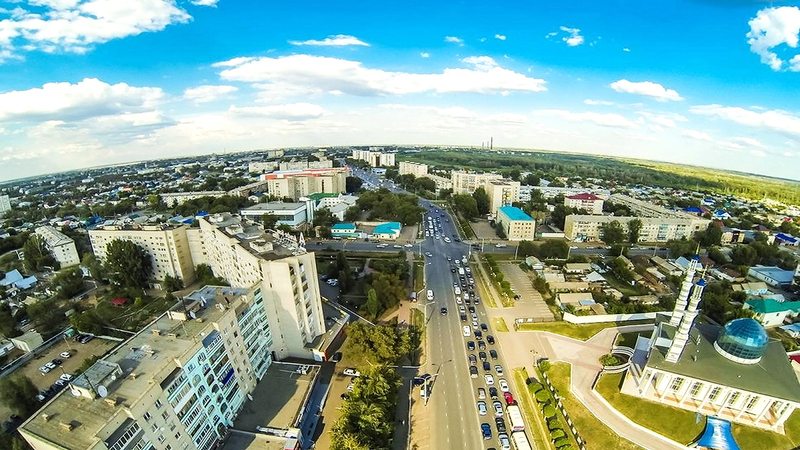 Uralsk is a city in Western Kazakhstan, on the Ural River. The administrative centre of the West Kazakhstan region, it occupies the northern part of the Caspian lowland. It is officially now known as Oral, but Uralsk is still widely used. Originally a settlement called Yaitsky Gorodok, established by Cossacks in 1584 at the confluence of the Ural and Chagan Rivers, Uralsk is both historically significant and aesthetically appealing, with vintage wooden houses surviving in the leafy southern part of the city, Kureni, where Cossacks originally settled. Yaitsky Gorodok played a major role in the Pugachev Rebellion in the 1770s. This is where renegade Cossack Yemelyan Pugachev declared himself the rightful tsar and gathered an army of Cossacks and peasants, some 10,000 strong, before being defeated by Russia's imperial forces and delivered to the mercies of Empress Catherine the Great in a small cage. She renamed the town 'Uralsk' to erase Pugachev's legacy. Pushkin later came to visit, to chronicle the rebellion. The town flourished under its new name, with new buildings appearing. It was the scene of fighting in the Russian Civil War, and the Red Army commander Vasiliy Chapaev was killed near here. A number of industries were established here in the mid-20th century and the discovery of the oil and gas deposit at Karachaganak in the region has been a significant boost for the city. Uralsk is located on the right bank of the middle course of the Ural River and on the left bank of the lower reaches of the Chagan River. The city is green with tree-lined streets and a number of historic buildings. One of the oldest and most respected buildings in Uralsk is the Ataman house, the residence of the ataman. Its facade is decorated with memorial plaques in memory of Pushkin, Zhukovsky, Dal and Tolstoy, who stopped during their visits to Uralsk. A statue of Pushkin also stands on the corner of Pugachev Street. 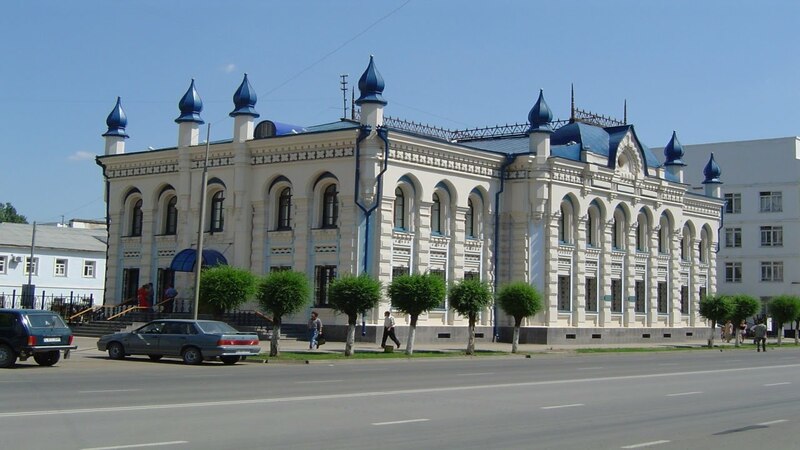 One of the most famous buildings in Uralsk is the house of the merchant Karev, built at the turn of the 19th and 20th centuries, which was for a long time the largest building of the city. According to legend, quarreling with his friend the merchant Ovchinnikov, who liked to drink tea in the morning on the balcony of his house and see the sunrise, Karev promised that Ovchinnikov would never see the sunrise again. And indeed, the house he built on the opposite side of the street cut out Ovchinnikov's sun forever. Among the many monuments in Uralsk are two of the participants of the Second World War - the machine-gunner Manshuk Mametova, who died in 1943, and the bust of Marshal Zhukov. The city park of culture and recreation, the oldest park in the republic, which was created in 1840 is located on the picturesque shore of Chagan, with two-hundred-year-old oaks. The park has been for many years the favourite place of the people of Uralsk. Aksai is located in the northern part of the West Kazakhstan region, surrounded by steppe, by the bank of the Utva river. It is about 150 km east of Uralsk. It originated from Novogeorgievsk, an agricultural settlement established by Ukrainian immigrants in the early 20th century. It also became a stopping point on the railway between Uralsk and Sol-Iletsk, with its railway station called Kazakhstan (a name the station still retains to this day). 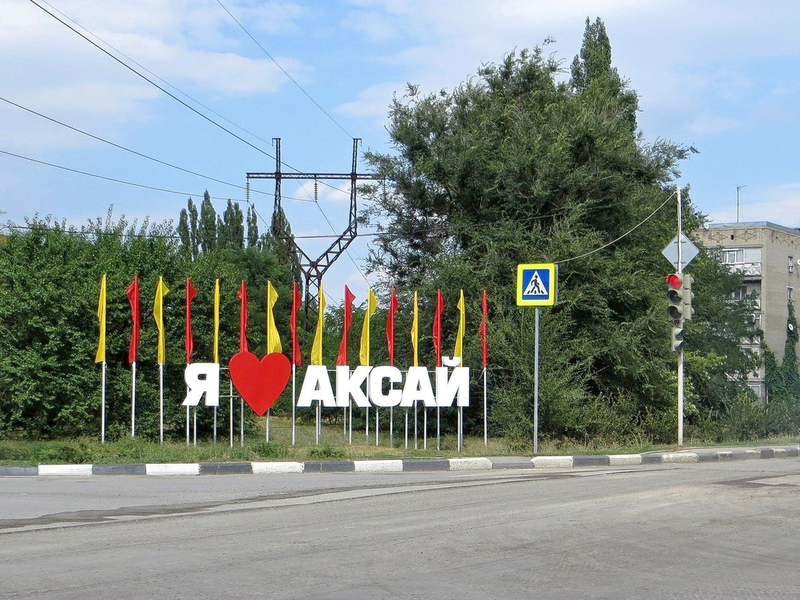 It was given town status in 1963, as the centre of Burlinskii district in the West-Kazakhstan region, and wasrenamed Aksai in 1967. In the years 1985-1992 several modern micro districts were established with nine-storey apartment buildings, constructed by Eastern European builders and there was also a social infrastructure development programme (schools, kindergartens, shopping centres). However, Aksai’s importance is primarily due to the presence of one of the world’s largest gas condensate fields, Karachaganak, 25 km from the town. 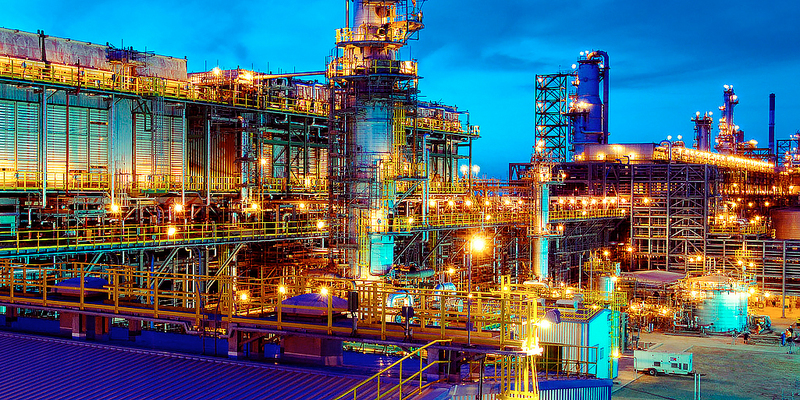 Development of the Karachaganak field has brought in investment from international Oil and Gas companies, and consequently a large number of local and international Oil and Gas service companies operate in the town, employing both local and expatriate workers. Many of the service companies are based in the Czech camp near the centre of the town. New hotels, restaurants and shopping centres have opened in the town. Tengiz field (Tengiz is Turkic for "sea") is an oil field located in northwestern Kazakhstan's low-lying wetlands along the northeast shores of the Caspian Sea. It covers a 2,500 km2 (970 sq mi) project license area which also includes a smaller Korolev field as well as several exploratory prospects. The Tengiz reservoir is 19 km (12 mi) wide and 21 km (13 mi) long. Discovered in 1979, Tengiz oil field is one of the largest discoveries in recent history. Tengiz is in the Zhylyoi district of the Atyrau region, and is approximately 330 km from Atyrau by road. The landscape around Tengiz is steppe – it is flat and dry. The climate is continental, and can range from +40C in the Summer to -40 in the Winter. 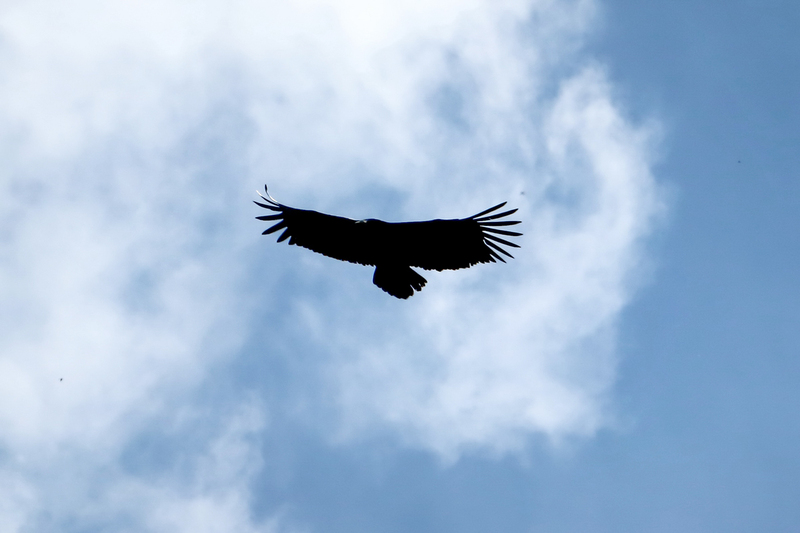 Horses, camels and eagles can be seen on the steppe. The nearest town is Kulsary, about 90 km away, which is the administrative centre of the Zhylyoi district. Kulsary developed as an industrial town in the last century, following the discovery of oil in the region (oil was first discovered in the area over 100 years ago). Kulsary has a railway station with connections to Atyrau, Aktau and Aktobe so most personnel travelling to and from Tengiz pass through here. The infrastructure around the Tengiz field includes offices, camps, accommodation and recreational facilities for the personnel working on the project. Bolashak established a global office the UK in 2009 to support its international operations. 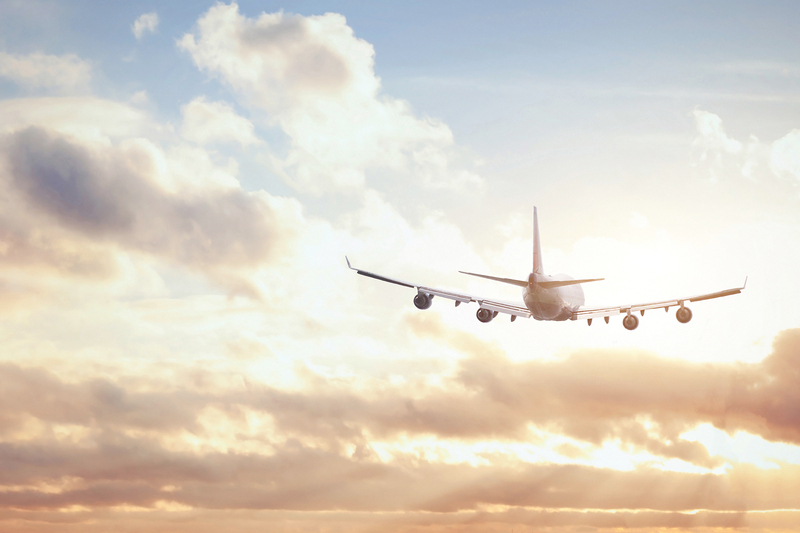 Bolashak International has experienced continued growth. We now manage a significant number of UK contractors through our office in Farnborough, we have a successful partnership in South Korea and are able to support other international locations through our global network. Bolashak opened the Farnborough office in 2014 as a satellite of our London operation, to support one of our major clients, whose UK project and engineering offices are in Farnborough. In order to further enhance the support and service to our Farnborough-based client and contractors, the decision was made to move the UK office in full to Farnborough in 2015. Farnborough is a town in North East Hampshire and is located 55kms South West of London. Its history can be traced back to Anglo Saxon times. The Anglo-Saxons were a people who inhabited Great Britain from the 5th century. They comprise people from Germanic tribes who migrated to the island from continental Europe. The name is formed from the Anglo Saxon Ferneberga which means "fern hill". Following the Norman Conquest in 1066 Farnborough gets a mention in the Domesday Book of 1086. For a while it was home to Napoleon III and his wife Eugenie. Napoleon III was the nephew of Napoleon I and was originally voted in as President of France in 1848, but seized power in 1851 and became Napoleon III through to his exile to Farnborough in 1870 following defeat in the Franco Prussian Wars. To this day he is interred in the Imperial Crypt at St Michaels Abbey in Farnborough with his wife. His former house is now a girl’s school. However it is a town that is probably best known for its association with aviation. The aviation history started in 1904 when the Army Balloon Factory moved to Farnborough and through many changes became the Royal Aircraft Establishment. 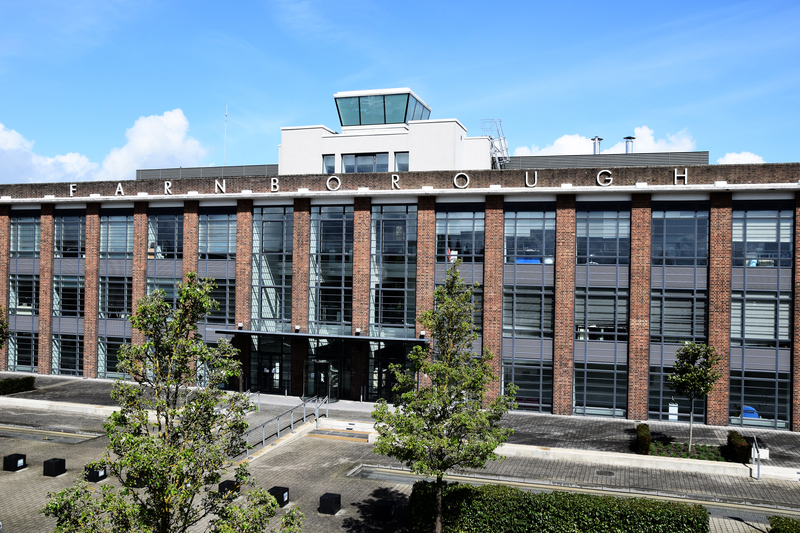 In 1908 Farnborough was the site for the first powered flight in the UK. In modern times a great deal of the aviation work has been privatised and the old site has been transformed into Business Parks. As you walk around the vicinity of our office park you can see the history which has been retained. Our building, The Hub, was originally Building Q134, which was the weapons aerodynamics building. It is also the home of the National Aerospace Library. As you can see in the picture it retains its aviation history with a control tower on the roof. 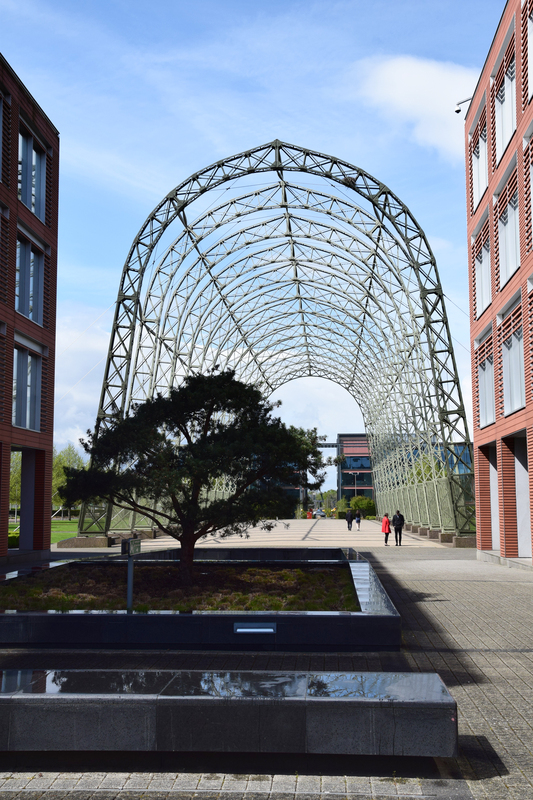 In current times Farnborough still remains an active business airport and is still home to the Farnborough International Airshow, which takes place every two years with Paris hosting the alternate years. We are kept busy supporting our main client and the many of our contractors working both in Farnborough and in other UK and international locations.